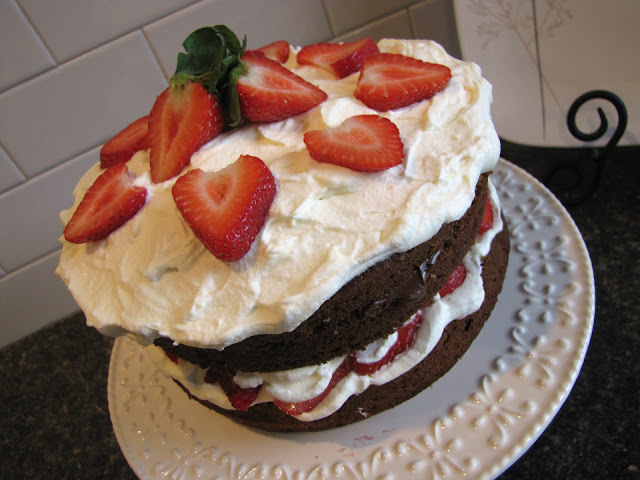 After enjoying a version of this cake at my friend Janet's place several times...I re-created it in my kitchen. It was my daughter's birthday cake a few weeks ago...and was a hit! Beat in eggs...and vanilla, bananas and buttermilk. Combine flour, salt, baking soda and baking powder. Add to banana mixture; stir until blended. Pour into two well greased nine inch round cake pans. Bake at 350 degrees for about 40 minutes...or until set in centre. Allow cakes to cool completely. Whip cream, vanilla and sugar until stiff. Split each cake layer in half horizontally. Spread the bottom half of each cake with a generous layer of Nutella, and reassemble to form two cakes. Create a flat top on one of the cakes by shaving off the rounded top. Set this layer on a cake plate...and spread with whipped cream, sliced strawberries and more whipped cream. Gently set remaining cake layer on top. Frost with whipped cream. Garnish with strawberries. Enjoy the goodness of bananas, strawberries, chocolate and hazelnuts all rolled into one...and smothered in whipped cream! ohhh...this looks & sounds wonderful! Will have to try it soon! This cake looks amazing and delicious! I love layered cakes. Ohhhhhhhhhhhhhh my, this may become a new favorite! A cake worthy of a special day! This layered cake looks delicious Judy. Banana, hazelnut, strawberries..all sounds wonderful. This is a work of art and love! Beautiful! I have a question. Is there supposed to be cocoa in this recipe? The cake layers look chocolately. Or is that just the nutella?